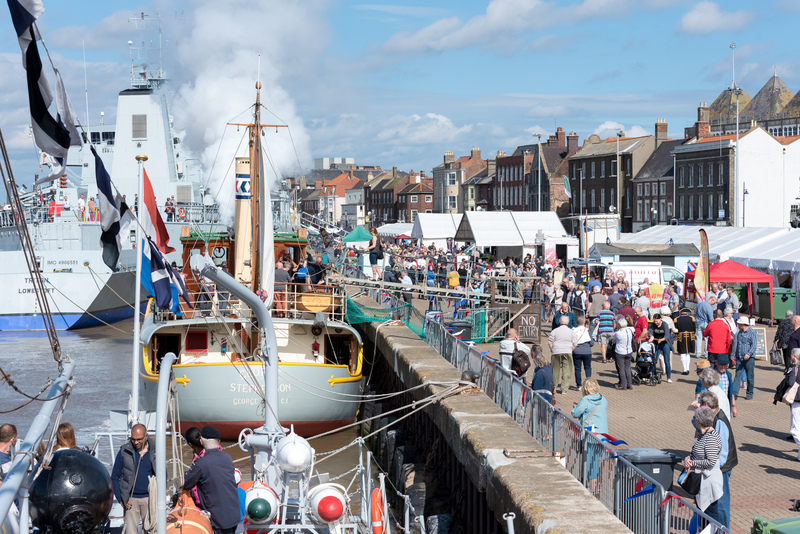 Shanty and folk music is performed throughout the Great Yarmouth Maritime Festival on three stages as the town celebrates its proud maritime past and maritime future. Shanty songs were traditionally sung by sailors as they raised the mainsheet and set sail on their long journeys at sea.The musical programme is managed by Great Yarmouth based Sue and John Griffiths who have been performing as shanty singers, The Mollyhawks, since the late 1990s. A fascinating range of vessels moor alongside South Quay during Great Yarmouth Maritime Festival for visitors to see. Additional visiting vessels are currently being confirmed with the Habourmaster, so watch this space for more details. Unfortunately, some ships and boats have to duck out at the last minute, due to operational commitments. As well as non-stop shanty music from a wide range of bands, the Great Yarmouth Maritime Festival has a variety of street theatre, costumed characters and performances of all sorts to keep you entertained. We’ve got the kids covered too with plenty of free activities and crafts. Watch all sorts of demonstrations at the Maritime Festival on South Quay, With lots of fascinating stalls to look at, including some great exhibitions and activities to take part in. A varied selection of food and drink is available at Great Yarmouth Maritime Festival.